2000 Additional posts are added to the Group IV 2018 Vacancies.Certificate Verification from 16th - 30th August 2018. So, the present vacancies will be around 11,000 and nearly 33,000 candidates will be called for certificate verification. TNPSC's Tentative Result Publication Schedule which is published in TNPSC Official Website http://www.tnpsc.gov.in/results.html , has informed that the Group Four 2018 result will be (tentative) published in the last week of July 2018. Group 4 Result to be published in 10 days - Dinamani News, 21-06-2018. 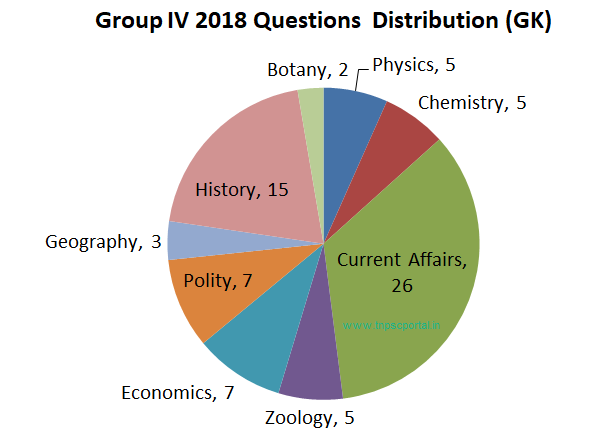 The news says the Group IV 2018 result will be published with in 10 days. Tamil Nadu Public Service Commission has published a 'Result Declaration Schedule for the exam conducted in 2016-2017' in its official website http://www.tnpsc.gov.in/results.html. In that schedule, TNPSC has notified the tentative date for publishing Group IV 2018 result as last week of July 2018. Group 4 2018 Exam notification was published on 14th November 2017 and the Examination was conducted on 11th February 2018. Now a days, TNPSC publishes all notification and results asper the scheduled dates, so we can expect the result of the Group 4 2018 exam to be published with in June 2018 . With reference to four controversial answer keys by TNPSC May result to 3 to 4 no question increase or decrease. Those who come under first 700 ranks have a chance to get VAO. But it varies communal category. There will be no too much of cut of difference between PSTM and normal. Because many have PSTM. Note : This is not an Official cut off , it’s just a prediction based on the data entered by Aspirants in Google contact form and discussed with peered group of aspirants among Tamilnadu. The short notification for TNPSC CCSE-IV (Group IV) 2018 is published in the newspapers on 14-11-2017 and the detailed notification is published in the Tamil Nadu Public Service Commission's Official Website www.tnpsc.gov.in/latest-notification.html. Maximum age limit for applying for tnpsc group iv exam varies for different categories. Is there any exception in maximum age limit to apply TNPSC Group 4 Exam ? Yes, there are exceptions for certain categories in the maximum age limit to apply TNPSC Group IV Examination . The details are as follows. There is no maximum age limit for TNPSC Group 4 Exam candidates belonging to SCs, SC(A)s, STs, MBCs/DCs, BCs, BCMs and Destitute Widows of all castes who possess a qualification higher than General Educational Qualification (SSLC / 10th) (For example, if you have passed passed 12th / H.S.C / Diploma /Degree / PG you dont have maximum age limit). What is the Educational Qualification to apply TNPSC Group 4 Exam? The required educational qualification to apply TNPSC Group IV Exam is SSLC /10th Standard . The candidate should have completed the SSLC or 10th as on the notification date of TNPSC Group 4 Exam. Tamilnadu Government provides 20% reservation (of total vacancies) to the persons who have studied the prescribed qualification (for group iv and vao exams, prescribed qualification is SSLC) in Tamil Medium . The previous year TNPSC Group 4 Notification gives the following condition for claiming PSTM reservation. "Candidates claiming Person Studied in Tamil Medium (PSTM) category reservation should have studied the prescribed qualification (For TNPSC Group 4 Exam, SSLC / 10th is the prescribed qualification) for particular post in Tamil Medium and should have the certificate for that." How to Prepare for TNPSC Group 4 General Tamil (Pothu Tamil) Portions ? 1. TNPSC Group IV Junior Assistant (Non-security), Junior Assistant (Security), Bill Collector, Field Surveyor, Draftsman - Rs.5200 - 20,200/- + Grade Pay 2400 ( First month salary nearly Rs.21,000 / - ). If you are a degree holder , you will get about Rs.1000 /- more. 2. TNPSC Group IV Typist Steno-Typist, Grade-III - Rs.5200– 20200 + Grade Pay 2800/- (PB-1) (PM) ( First month salary nearly Rs.20,000 / - ) . If you are a degree holder , you will get about Rs.1000 /- more. Start Practicing as many as Model Questions you can ! The CCSE-IV (Group 4) 2018 Exam is expected to include posts such as Village Administrative Officer, Junior Assistant, Bill Collector, Field Surveyor, Draftsman, Typist and Steno-Typist (Grade III). Recently TNPSC has clarified that there will be no changes in age limit and other qualifications for both Group 4 and VAO exams. "Download TNPSC Group IV Model Questions Subject wise by Dinathanthi Newspaper and Appollo Study Centre, Chennai"